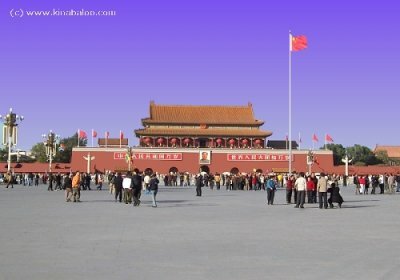 Tiananmen Square is the geographical center of Beijing City. It is the largest city square in the world, occupying an area of 440,000 square meters (about 109 acres), and able to accommodate 10,000,000 people at one time. The square is a conglomeration of splendid and beautiful flowers and the red national flag which flutters in the wind. The raising of the national flag is something which should not be missed by visitors to Tiananmen Square. Find more TianAnMen Square images in the gallery of Photorena.